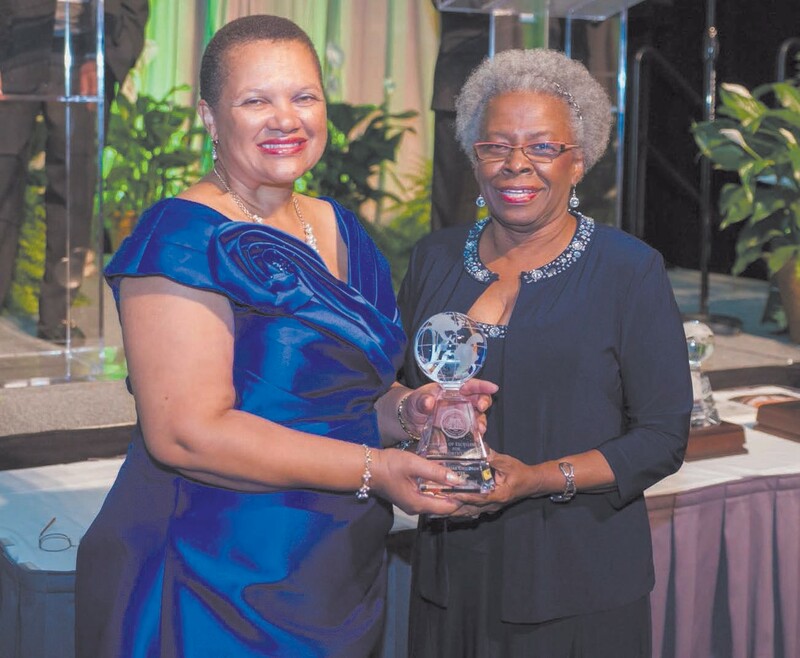 Savannah State University’s (SSU) 125th Anniversary Gala was held Saturday, November 14, at the Savannah International Trade and Convention Center. Governor Nathan Deal was the speaker for the gala, the hallmark event of the university’s quasquicentennial celebration. Net proceeds from the university’s premier fundraiser, silent auction and acclaimed community event will support student scholarships. During the black-tie affair, the university presented Awards of Excellence in service, leadership, scholarship and philanthropy. For 32 years of military leadership in the areas of manpower, personnel, training and education, the Award of Excellence for Leadership was presented to Rear Admiral Annie Andrews ‘83, who recently retired from the U.S. Navy. During her tour at Recruit Training Command, Great Lakes, Andrews led the training efforts of more than 100,000 sailors for duty in the fleet and was instrumental in the commissioning of the Navy’s only immersive simulator trainer, the USS Trayer. For their immeasurable support to help educate Savannah State students, the Award of Excellence for Philanthropy was presented to Robert Jepson, Curtis Anderson and John Kane. In 2008, Savannah entrepreneur and philanthropist Robert Jepson developed a plan to provide full-tuition and housing scholarships for bright, deserving public school students. Joined by Savannah residents Kane and Anderson, the three businessmen established what is now the Savannah State University Board of Visitors Scholarship Fund. For being a pioneering pediatric surgeon who continues to make significant contributions to the medical field as an adjunct clinical associate professor at Morehouse School of Medicine, the Award of Excellence for Scholarship was presented to James Franklin Densler, M.D., ’54. Densler received his medical degree from Meharry Medical College in Nashville, Tenn., in 1961 – the first to do so with honors. For having a strong record of community collaboration, for providing services to help low to moderate income families achieve economic stability and for being a catalyst of social change, the Award of Excellence for Service was presented to The Economic Opportunity Authority for Savannah-Chatham County, accepted by the agency’s executive director John Finney. The Economic Opportunity Authority of Savannah-Chatham County’s services range from early childhood education to homebuyer education and services for the homeless to job development and training to energy assistance for low-income residents. For being a haven for homeless youth and being a bold proponent for the healthy development of children and young adults, the Award of Excellence for Service was presented to the Greenbriar Children’s Center. Greenbriar provides homes for orphaned and homeless juveniles as well as housing for young adults who have nowhere else to turn. Laurita Taylor, assistant director of Greenbriar, accepted the agency’s award. The gala co-chairs were Charles F. McMillan, president and owner of Mc- Millan and Associates, and David E. Paddison, president of Seacrest Partners, Inc. The title sponsor was SSU Foundation, Inc., and the presenting sponsor for this year’s gala was Thompson Hospitality, SSU’s foodservice provider.